Hugely practical modern retail shelving has never been so popular. With more colours and accessories available gone are the days of thinking it sterile looking. Our Evolve & Eden Shelving is a product with an unrivalled cost-benefit ratio that displays your products effectively and beautifully, whatever the nature of your business. You may want to take a look at the great many accessories that we have to compliment this easy to fit modular shop shelving system. Also if needing inspiration or a quote to supply or fit we are long in the tooth dinosaurs of the shop fittings world so please just call. EXAMPLE A: 4 legs are required. 1 leg is supplied with each bay. An additional 2 x end legs will need to be ordered for this configuration. EXAMPLE B: 3 legs are required. 1 Leg is supplied with each bay. An additional 1 x End leg will need to be ordered for this configuration. Using example B, if you required 3 runs of two bays then you would need to order an additional 3 x end legs, one for each run. 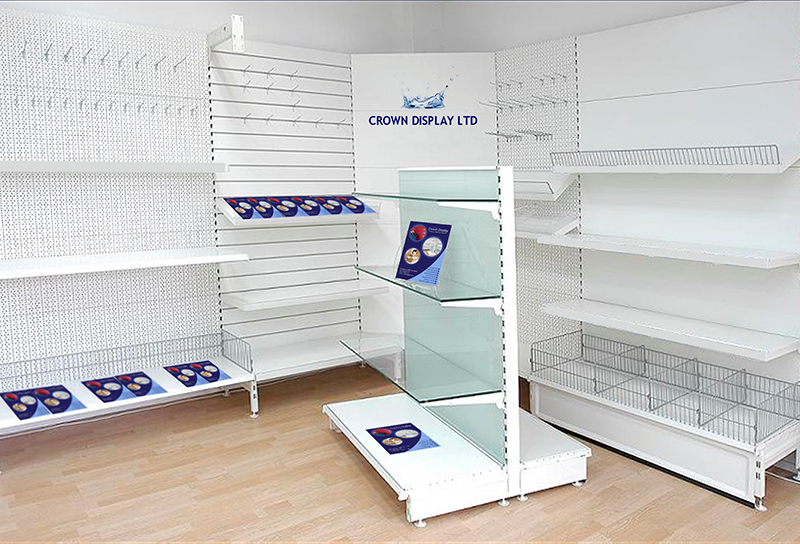 We have an extensive range of retail shelving fixtures and fittings for retail outlets in all market sectors but, over the years, our best sellers have always been those that are common to shops of all types, across the United Kingdom. For example, our slatwall panels and inserts are very popular with all of our customers, owing to our highly competitive prices and the quality of the panels produced by our UK manufacturing partner. 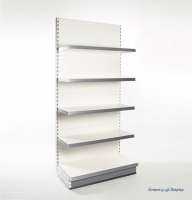 Our fantastic range of retail shelving is another perennial favourite with UK store owners. 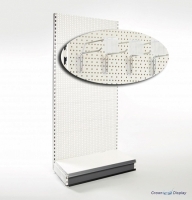 This collection includes standard wall bays, gondolas, perforated bays, and a range of compatible accessories. From glass shelving to chrome stacking baskets, we have everything you need. Whether you are just setting up shop or you have been in business for many years, you are guaranteed to appreciate the great value products in this range. 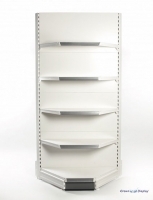 Our shelving is authentic, quality tested and environmentally friendly for use in retail, and our skilled shopfitters can ensure easy installation. 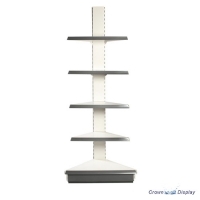 If you are looking for specialist fittings designed to hold particular products, such as crisp bays, newspaper units, garment and card bays, you will want to check out the extremely popular selection of retail shelving for sale in our online store. 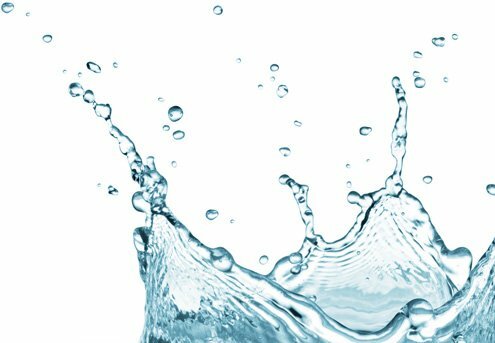 All made to exacting standards and available via our express delivery service, the many high-quality products in this section are sure to be of interest. 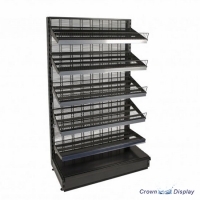 At Crown Display, it’s our pledge to supply retail shelving of the highest quality at the very best prices. We utilise fair trade methods and the skills of local craftspeople wherever possible, and we only used environmentally-friendly wood and source from businesses with socially-responsible characteristics, so when you buy from us, you can do so with total confidence. 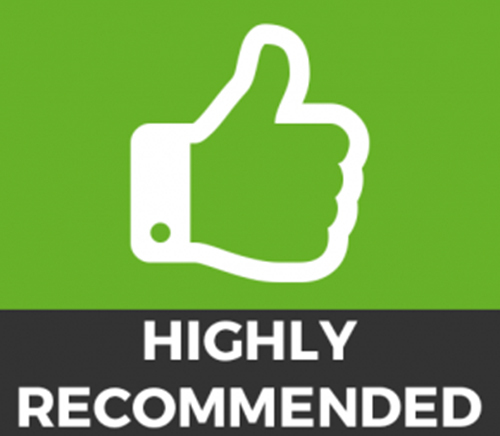 If you would like to enquire about any particular shelving product, please contact us by phone on 0800 587 5880. 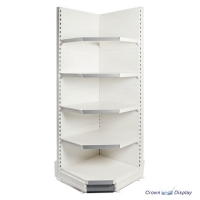 Alternatively, you can send an email to our friendly team at sales@crowndisplay.co.uk and we will be in touch to discuss your retail shelving requirements.